Anthony Pettis is set to face Stephen ‘Wonderboy’ Thompson this weekend, at welterweight. This marks the former lightweight champion’s first fight at 170lbs. When talking on potential match-ups for Pettis at welterweight, a name that came up is UFC newcomer, Ben Askren. During his UFC Nashville pre-fight scrum, this topic was brought up. Pettis had high things to say about his fellow Rofusport teammate, Askren. He says that he has done enough rounds with Askren in the gym to know that a bout with the former Olympian would not go well. Ben Askren is a former Olympic wrestler, and undefeated in his MMA career. It is no secret that Anthony Pettis has struggled against similar stylistic match-ups as Askren presents. The heavy wrestling pace of Askren would provided Pettis with tough times. Anthony Pettis vs Stephen Thompson takes place this weekend in Nashville, TN. It airs live on ESPN+. Ben Askren Will Meet Jordan Burroughs In A Wrestling Match! 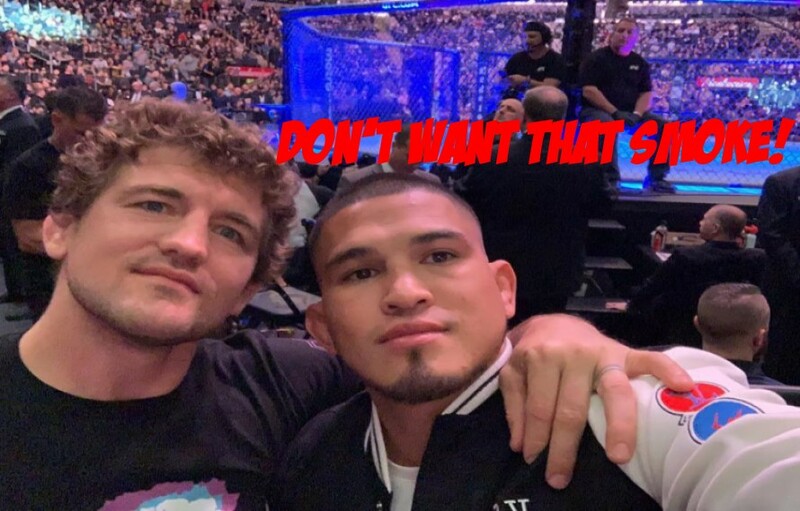 Ben Askren Demolishes Dillon Danis In A Twitter Spectacle!